The PB-5 sets a new standard for precision pulse generators. 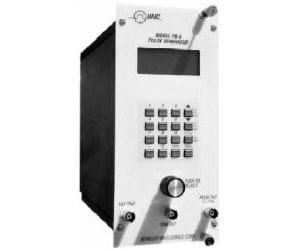 It offers full digital controllability with a built-in ramp generator for linearity testing. It provides tail and flat top pulses with outstanding integral linearity and extremely low amplitude change with temperature. The PB-5 is capable of testing the stability, linearity and resolution of the most demanding spectroscopy circuits and instrumentation. It is the successor to the industry standard, PB-4. The 4x16 LCD display, keypad, and a spinner knob provide a user interface that is easy to use. RS232 interface is also standard along with memory that will store and recall nine complete pulse setups. The Model PB-5 provides unprecedented performance in a precision pulse generator. It includes a full-featured, highly flexible ramp generator and programmability. As a precision pulse generator, the PB-5 surpasses or equals all existing designs in the important performance areas of resolution, linearity and stability. The pulse repetition rates, which are variable over a broad range, go up to 0.5 MHz. The higher rates are required when testing for MCA and PHA linearity because of the high number of data points required for a statistically valid test. The built-in ramp generator allows you to control ramp duration, the number of ramps and the ramp limits. Now you can test the entire range of your system or just a portion of that range. This ramp generator and precision pulse generator combination allows you to tackle the most demanding applications. The new user interface is intuitive and easy-to-use. Parameters can be selected and changed by spinner knob and/or keypad pushbuttons.